This weeks show included classic songs by Dixie Dregs, Ian Hunter and Genesis. The show is available until next Saturday using the On Demand feature. The show is also repeated on Tuesdays at 9pm. "It may have been raining a little bit this week. In fact we've had some serious thunderstorms in Dublin. But it's still a wonderful summer as far as I'm concerned. 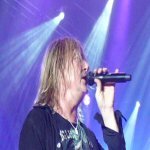 Welcome everyone to the Joe Elliott show right here on the very wonderful Planet Rock. Had one or two enquiries, specifically this week regarding the theme tune to my show. It's a song from Def Leppard's 1999 Euphoria album. A track called Disintegrate which was written by Phil Collen. And it reminds me of how wonderful it is when you get a theme tune that really ties you into a show. And as a kid growing up this one for me is something I will never forget. T.V. on the radio anybody?." "I remember when I first heard that song back in I think it was about 1974 and thinking how great it is to be born in England and hear all this very eccentric music that was infiltrating the pop charts. Stuff like Roxy Music and Sparks and there we had from the album Selling England By The Pound. Their very first hit Genesis of course in those days featuring Peter Gabriel on lead vocals with their first hit single a song called I Know What I Like (In Your Wardrobe). And before that from the album Strangeland which featured some fantastic guests including Jimmy Page, Jeff Beck, Roger Chapman of Family and Streetwalkers and the late Rory Gallagher on guitar. The album is called Strangeland, the band Box Of Frogs and the track you just heard which did feature Jimmy Page was a song called Asylum. And that folks brings us to the end of the show. I shall be back with you next week as always been a pleasure. Until then I'm gonna leave you with this. Sounding somewhat like early Ricky Warwick or a punkier Thin Lizzy. This is The Gaslight Anthem from the album Handwritten and a song called 45. Until next week see ya!"